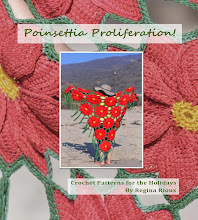 Monster Crochet: You crocheted a what??? Yep, it's an ostomy bag. Okay, I know you all think I have lost the few marbles I have left, but no, I am completely (well, relatively) sane. I was COMMISSIONED by our own Lori (of Shrone-dom glory) to work-up this dee-lightful creation. Hi Lori! Never one to turn down a challenge, I figured what the hey I'll give it a try. Lori sent me a few pics of an actual bag to work from along with measurements and I hit the ground running. Upon first viewing of the examples Lori sent, I knew that (i) I really wanted her to be able to see the bag contents from the outside and (ii) that I would need to incorporate eyeball(s) at her request. 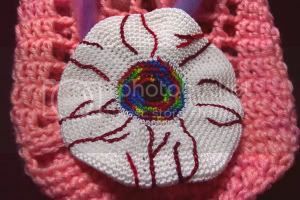 Need something odd, interesting or a even bit wacko crocheted? Who ya gonna call? LADYLINOLEUM. OMG!!! That is so friggin cool!!!!! That is so cool you did that! Lori will love that! Great job! I love my new ostomy bag filled with eyes. 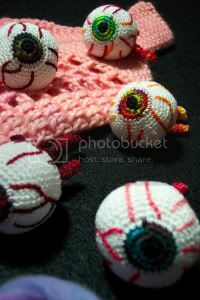 I'm thinking it has magickal powers like runes and I shall start "diving with the eyes" to prognosticate fortunes, portends of doom, and random auspicious occasions just lurking in the depths of the Essence, waiting to unfold and manifast before these wonderfully crocheted orbs of unknowable wisdom. Only time will tell if the eyes are good or evil. I'm hoping they will be a little on the saucy side with a penchant for smart-mouthed predictions. I'm rather fond of it when The Powers That Be display a sense of humor. OK Two things: Regina, you rock! That is so cool! Lori, will you read your eyeballs for me? that's amazing regina, made me giggle. my dad just had a colostomy in april and has is doing chemo now......and i really needed to laugh about it. before my baby i worked in the hospital and we used to laugh at stuff all the time (not in front of patients of course) because if you aint laughin, your cryin! Please don't ask why, but I have a recreational interest in medical devices. I have a hip replacement which I use as a paper weight. So for me, the 'bag takes the biscuit! Wonderful! You're always sooo cooool! That's amazing ,such fun ! Excellent work, LadyLino! I was wondering how you would create this commission. 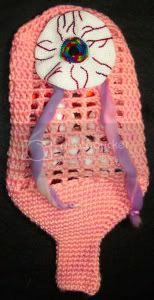 We had discussed putting some crocheted food in the bag, but I think that your final version, just with eyeballs, is perfect. Save the food for the inside of the "Visible Man" model! That is absolutely freaking WONDERFUL!!!!! I'll add your blog to my links so I can came back. Thanks everyone! Lori is the queen behind this idea. I have to admit that it stumped me at first, but I figured it out! Lori, you must give me an eyeball reading. Jana totally agree with you about the laughing instead crying thing. Sometimes it's the only way to cope. uhm, just wow. 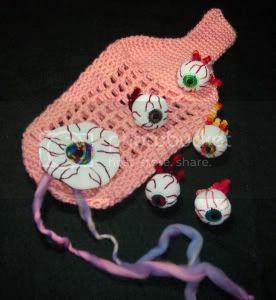 I can crochet scarves, and afghans, but an ostomy bag full of eyeballs? That's sheer genius. Love the veggies too. My dear, you are a true artist! IBD sufferers the world over should now be relieved that there is now a monster colostomy bag, just in case we need it!!!! Kim, if you need a customized ostomy bag (hopefully not), I'm your girl!